Eureka Entertainment have announced that they will be releasing The Tarnished Angels, one of the most acclaimed films of the 1950s, and a favourite director of Pedro Almódovar, Quentin Tarantino, John Waters, Todd Haynes, Kathryn Bigelow, and more. One of legendary director Douglas Sirk's most cherished passion projects, this spectacular adaptation of William Faulkner's Pylon has risen in stature to become one of his most acclaimed films. Reuniting with his core creative team from oil tycoon saga Written on the Wind, Sirk this time examined the marginal lives and lost souls living one rung from the bottom with surpassing delicacy and artistry. Evoking Depression-era New Orleans with glorious black-and-white CinemaScope photography, Sirk's spellbinding chronicle of personal obsession, romantic longing and irreconcilable desires now appears as one of the most extraordinary films to come out of 1950s Hollywood. 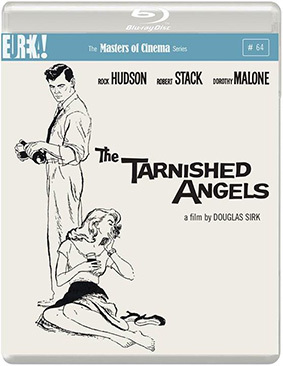 The Tarnished Angels (1957) will be released on blu-ray for the first time anywhere in the world by Eureka as part of the Masters of Cinema series on 19th August 2013 at the RRP of £19.99. 40-page booklet featuring the words of Douglas Sirk, vintage reportage from the film set, rare imagery, and more!